Looks like a good year so far. I love the pictures and I hope when I retire that I have grandkids to help me garden. It is that time of the summer. Harvests are coming in nicely. So far, I have harvested 26 pounds of Rattlesnake Pole Beans from a 2' x 9' bed. I have no idea how that compares to others, but compared to previous years for me, it is very good. Tomatoes are coming in fairly well this year. I started with 8 plants in my SFG then added 4 potted tomatoes. I have been fighting diseases as I do every year but this year I am stagger planting tomatoes to keep some healthy at all times. Excuse me while I break down and cry. Those are beautiful. @sanderson wrote: Excuse me while I break down and cry. Those are beautiful. Oh, good heavens! Yes, they do!! @yolos wrote: I have been fighting diseases as I do every year but this year I am stagger planting tomatoes to keep some healthy at all times. My mouth is watering from gazing at those beautiful tomatoes! I am trying to do some stagger planting as well, by rooting suckers from my original plantings. A new experience for me, but hoping it works! Tomatoes are coming in faster than I can eat or process them. But they are beginning to become diseased so I don't know how long they will last. If I can get my act together I can plant out my suckers which I have rooted. Green pole beans (rattlesnake) are growing better than ever. 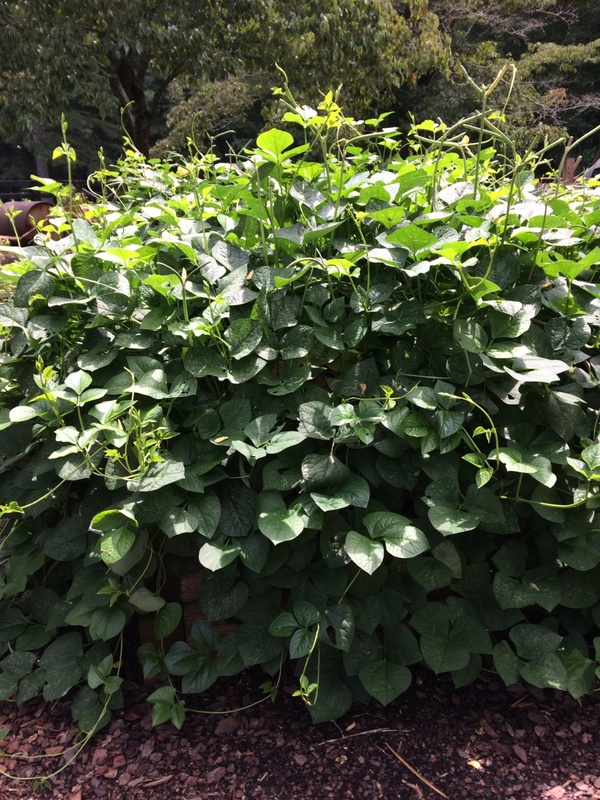 A 2 foot x 9 foot bed has produced 36 pounds of beans so far and it is still growing. Corn has just started to come in. 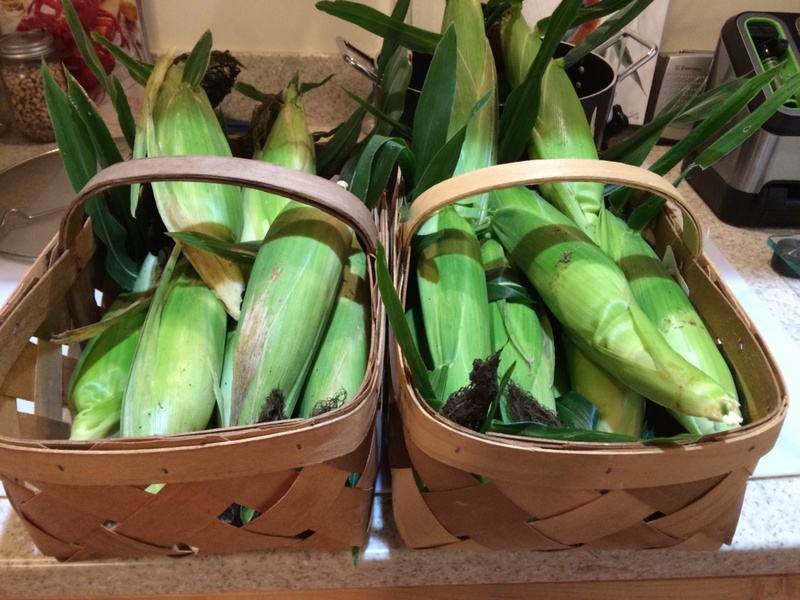 On July 3 I harvested 6 ears of corn and had those for 4th of July dinner. I just picked another bunch of corn (about 10 ears) for dinner tonight . That should just about take care of my first planting of corn. I have another 5 plantings of corn to harvest planted about 7 - 10 days apart. Here I go again, breaking down and crying. Those are beautiful. @sanderson wrote: Here I go again, breaking down and crying. Those are beautiful. I hope your ears come out looking nice. I had to cut the last inch off the ears because the pointy end just did not fill out due to pollination I guess. But mostly they were fairly well pollinated. So my method of cutting off the top of the tassel and using it like a paint brush on the silks seems to have worked on the first two plantings. Please see my post under Corn. Corn - about 20 ears. I was late harvesting the second planting but the third planting should be fresh. 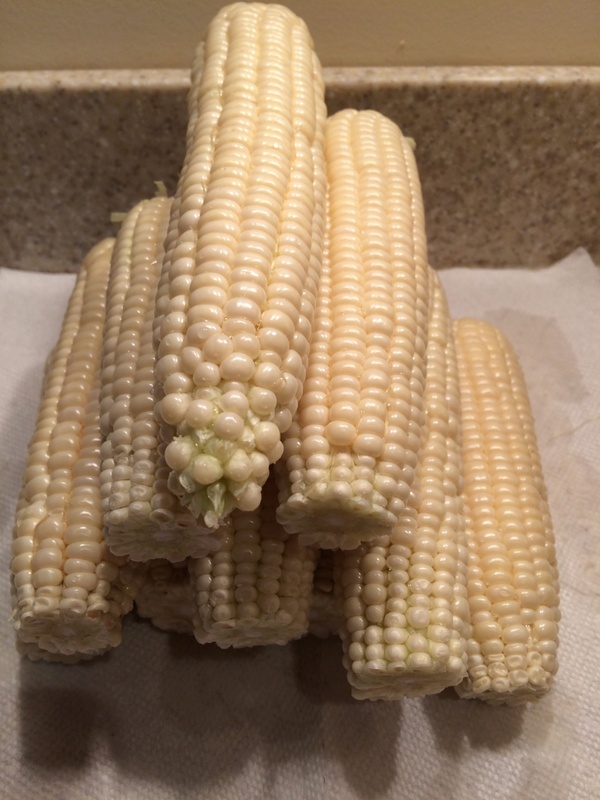 On the over-ripe 10 ears I will blanch, cut off the kernels, and freeze the cut corn. 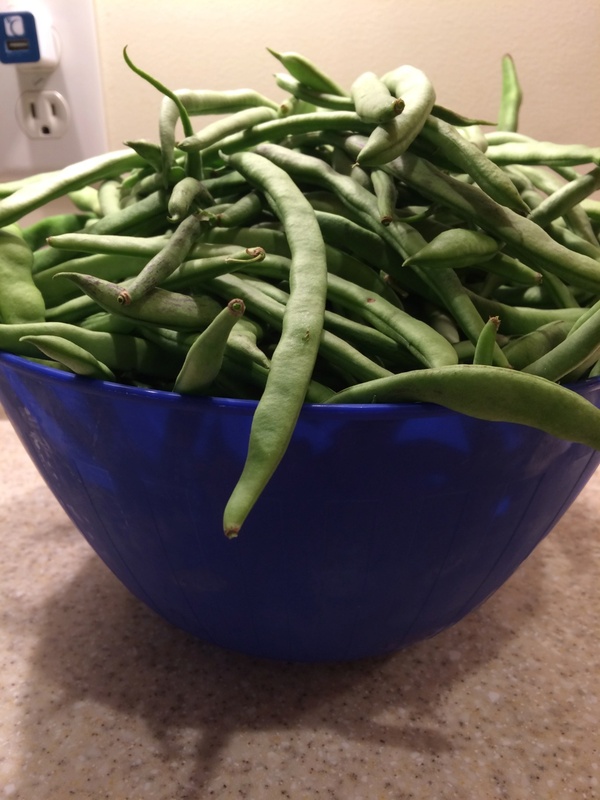 Rattlesnake Beans - Today's harvest was 5 pounds. The total this season in this 2 x 9 bed so far is 50 pounds. I have another 2 x 9 that was planted later and is just starting to flower. Another 2 x 9 is just starting to climb the trellis. 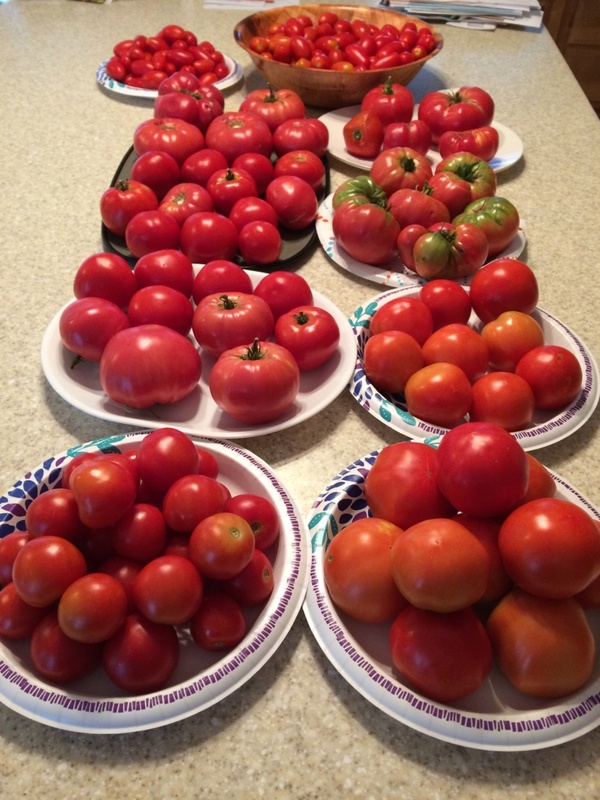 Tomato Harvest - from the past week or so. Cowpeas - just starting to bloom. BUT, one of my 4 x 8 beds filled with Lady Cowpeas is covered with aphids. About 10 days ago, I washed them off the plants with a hard spray of water. Last week I sprayed with neem, and today I sprayed with insecticidal soap. They come every year and attack only the cowpeas. Cucumbers - I harvested about 8 cucs today but only two were small like I like them. 6 of the cucs were big and I am not sure I will be eating those. Yolos, When I grow up, I want to be a Gardener like you! @sanderson wrote: Yolos, When I grow up, I want to be a Gardener like you! Thanks Sanderson. But the aphids are really making me mad. I have tried neem and now Dr. Bronners and they are still attaching themselves to the 3 varieties of cowpeas. Diseases are killing the tomato plants about 1 per week. I missed pollinating the 4th planting of corn so we shall see how it does without my help. Cucumber plants are just coming down with downy mildew. But rattlesnake beans are coming in so good that I may have to start giving some away if the last two plantings do as well as the first planting. Thank you for reminding what beans I recently planted - Rattlesnake! Mine are coming in good, also. All of the others have something, probably spider mites although I don't see webs. I sprayed with Neem and have been washing the plants. It was only 104*F.
I look to you for gardening hints and schedules because, for some reason, your environmental timing matches mine. 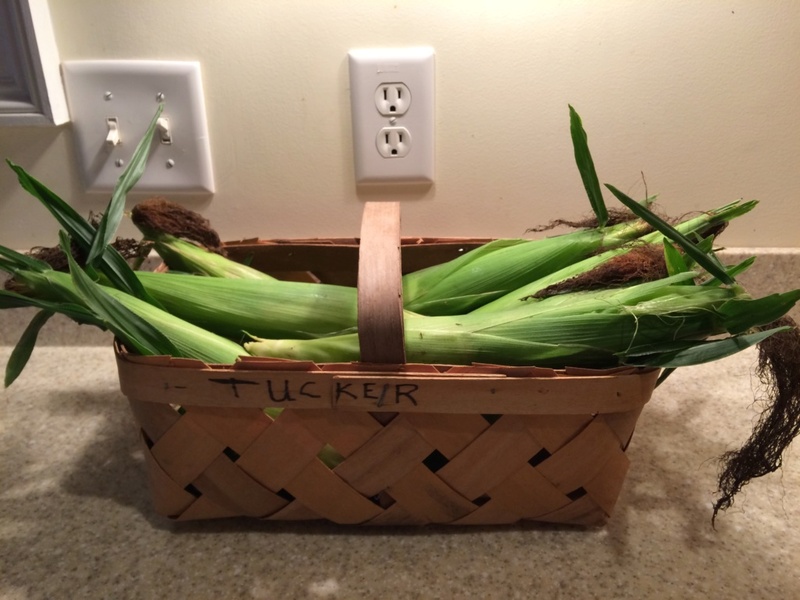 Corn - I had a great season with my six plantings of corn EXCEPT some critter ate my last two plantings of corn. Would have been about 32 more ears of corn. It bent the corn stalk over and harvested the cobs. Then dragged the cobs around the garden as they ate the kernels. Rattlesnake Beans - good crop this year. On my first planting, so far I have harvested 71 pounds. I have cooked and placed in food saver bags 33 side dishes (4 cups of beans each) of beans and ham hock. I just started to harvest my second planting of beans and I still have one more planting that has not started to produce yet. Tomato - plants are beginning to become diseased and are dying. 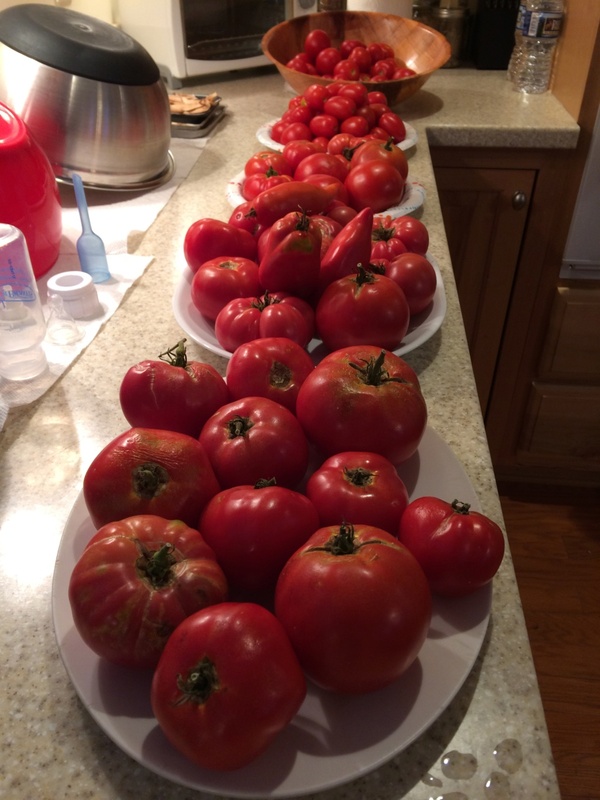 I had fairly good production and have skinned, deseeded, cored and frozen 48 cups of tomatoes so far. Cowpeas - Pinkeye Purple Hull cowpeas. They started maturing a couple of days ago. This year I broke down and purchased a hand-crank pea sheller. It had real bad reviews but it worked fairly well for me. So far I have 4 cups of fresh peas that I blanched and then froze. At the end of the season, I will defrost and cook all of the peas and then divide them into side dishes that I will freeze in food saver bags. The Lady cowpeas and White Acre cowpeas have not started to mature as of now. Cucumbers - all dead from downy mildew and pickle worms boring into what few cucumbers survived. That corn damage sounds like Raccoons. 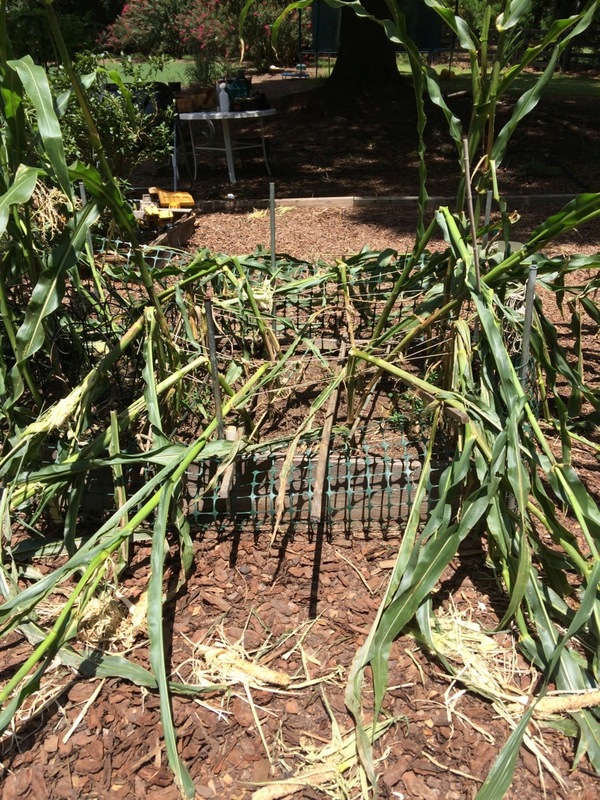 They love riping corn, and near impossible to keep out of the garden. Sorry to hear it was destroyed. @yolos wrote: News from the garden - 08/07/18. . . Rattlesnake Beans - good crop this year. On my first planting, so far I have harvested 71 pounds. I have cooked and placed in food saver bags 33 side dishes (4 cups of beans each) of beans and ham hock. I just started to harvest my second planting of beans and I still have one more planting that has not started to produce yet. And I have enough for one serving! I'm sorry the critters got your corn. I can just picture the racoon family working together to fell and husk the corn. Thank goodness you already had a good harvest. I still have things growing in the garden although many are diseased and being eaten by bugs or critters. The Rattlesnake Beans are a win this year. 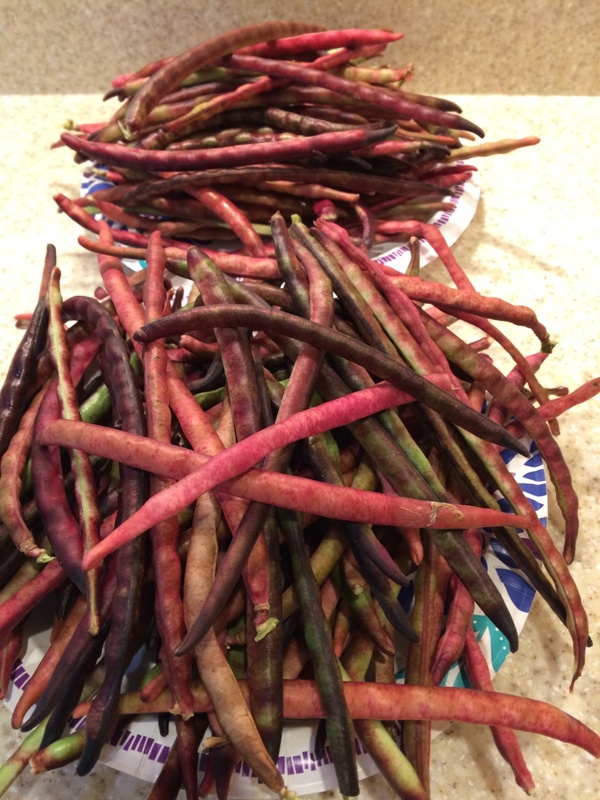 So far I have harvested 94 pounds of beans. I have cooked and frozen 30 side dishes (4 cups each) and have an additional 13 meals frozen but not fully cooked. 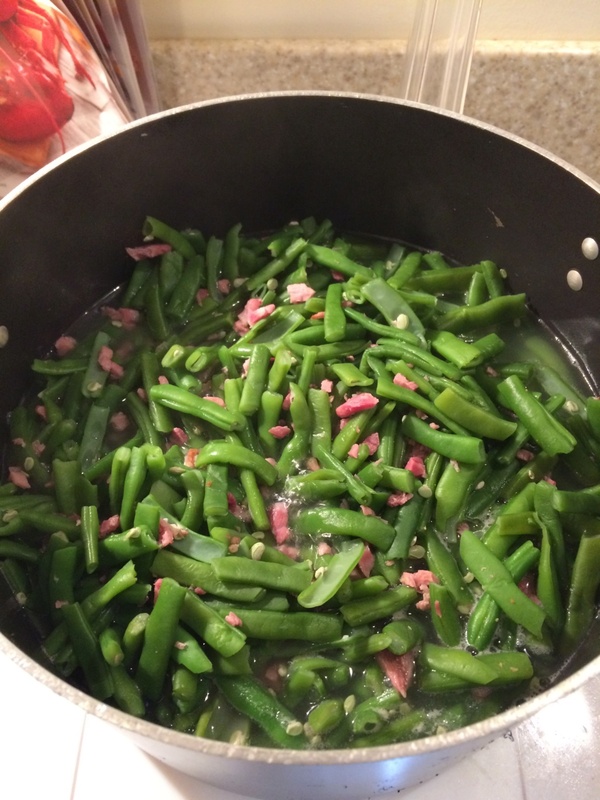 I am cooking them using the southern method of beans and ham hocks. Here is a picture of one pot of beans being cooked. The last two plantings of corn were eaten by some critter but we harvested about 64 ears before the raccoons found them. All of the tomato plants which I planted in April are now diseased beyond salvation and I have started removing them. But I did freeze 45 cups of skinned and peeled tomatoes already. I have planted an additional 6 plants for some late season tomatoes. The Pinkeye Purple hull cowpeas (4' x 8') and the White Acre cowpeas (4' x 8') are coming in now. I purchased a cheap pea peeler which is helping with prepping them for freezing. The Lady Cowpeas (4' x 8') will start to come in shortly. These are the Lady Cowpeas and as you can see they have spider mites nibbling on the leaves. All my peas and beans get spider mites. I have been spraying them with a soap solution and sometimes neem which will keep them producing but never really gets rid of the spider mites. @yolos wrote: These are the Lady Cowpeas and as you can see they have spider mites nibbling on the leaves. All my peas and beans get spider mites. I have been spraying them with a soap solution and sometimes neem which will keep them producing but never really gets rid of the spider mites. I have had really good luck with using Spinosad to get rid of Spider Mites - they disappear almost instantly. I use Captain Jack's Deadbug Brew spinosad, which I get a Lowe's. I have tried Neem Oil, but it never worked against the spider mites. Yolos, did you use a soap (like Dr. Bronner's) or detergent (like Dawn)? I'm in the process of pulling out all of my beans except the Rattlesnake. In an earlier post, you mentioned aphids. Did the beans then get spider mites? Ohio, Spinosad works but can be fatal for bees and wasps and pollinating flies. Do you just spray it on the beans? Photo, make and model of your inexpensive pea peeler? I didn't know they made such a thing. Can I grow shell peas (? correct term?) this fall and winter? @sanderson wrote: Ohio, Spinosad works but can be fatal for bees and wasps and pollinating flies. Do you just spray it on the beans? Spinosad is minimally toxic to bees, and only if they become in direct contact with it. I never spray blooms or during the active times of the day when pollinators are busy. If I see a destructive insect outbreak, which we have had a lot of this year due to the cool, wet summer, I will spray the affected plants late in the evening so that it can kill them overnight and be dry by the next day's activity. Spinosad has a very short half-life of 2 days, so it does not stay toxic to insects for very long. @sanderson wrote: Yolos, did you use a soap (like Dr. Bronner's) or detergent (like Dawn)? I'm in the process of pulling out all of my beans except the Rattlesnake. In an earlier post, you mentioned aphids. Did the beans then get spider mites? Sanderson - I used Dr Bronner's two times and Neem one time to try to get rid of the spider mites. I could not get rid of the spider mites. I got rid of the aphids for a while but I just noticed they are back. I have spider mites every year on my bean leaves and aphids every year on my cowpeas. Both the beans and cowpeas continue to flower so spraying most things is dangerous to the bee hives which are only 10 feet from the garden. Also, the instructions on Captain Jack's say you have to wait 3 days after spraying before harvest. Well both my beans and cowpeas have to be harvested every other day. Waiting 3 days will make the cowpeas dry and the beans too mature with too many strings. I know also have some other insect eating on the leaves which I have never had until this year. They look similar to lady bugs with small black dots on their backs. I do not think they can fly. Their shells seem fairly hard. Sooooo - I think I will try the Captain Jacks on the beans because I already have enough beans and can stand too pick some that are a little too large (I can use them as shellies). I could also probably spray the newest plot of cowpeas because they have just begun to set on and I can wait the 3 days before harvesting them.